There seemed to be a lot of buzz around the opening a new Georgia Reese's Southern Table and Bar when we visited Indianapolis earlier this summer. The restaurant is the second in a group of eateries opened by retired Indianapolis Colt linebacker and Super Bowl XLI (2006) champion Gary Brackett with his business partner , restaurateur Jeff Smith. The pair bill the restaurant as an upscale urban eatery featuring authentic Southern-style comfort food like fried chicken, shrimp and grits, oyster po'boy sandwiches, ribs, catfish and peach cobbler along with a large selection of fine bourbons, wines, beer and cocktails. The restaurant decor is pretty swanky, but the food definitely lives up to its billing as #HonestGoodnessSoul and Brackett's promise to bring tasty Southern Cuisine to the Hoosier Heartland. Brackett stresses the importance of family at Georgia Reese's, which he named after his youngest daughter. The first Georgia Reese's opened on the northwest side of Indianapolis in 2011, while the one we visited opened this summer in the heart of downtown town near Monument Circle. Brackett signed with the Colts as an undrafted free agent from Rutgers University in 2003, ending his football career by leaving the Colts in 2011. 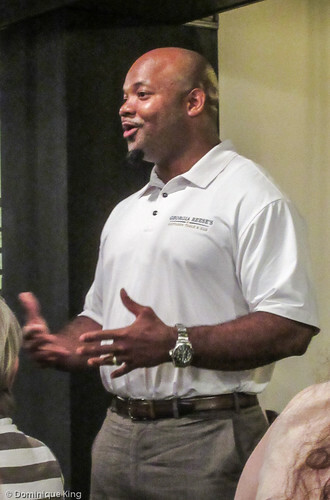 Brackett earned his MBA from George Washington University in 2011 and established the Brackett Restaurant Group. He quickly became part of Indy's thriving foodie scene by becoming the owner of a local chain of six Stacked Pickle sports bars and opening Georgia Reese's. The affable Brackett impressed us with his enthusiasm for the restaurant and Indianapolis, as well as with his desire to see his guests enjoy themselves and their meals. We definitely got the impression that he is a knowledgeable and hands-on restaurant owner. We sampled a few of the restaurant's popular appetizers like Country Fried Green Tomatoes, chicken wings slathered in a house-made Coca Cola barbecue sauce and fried alligator bites (we've had alligator in Detroit before, and this version was tender and nicely spiced). 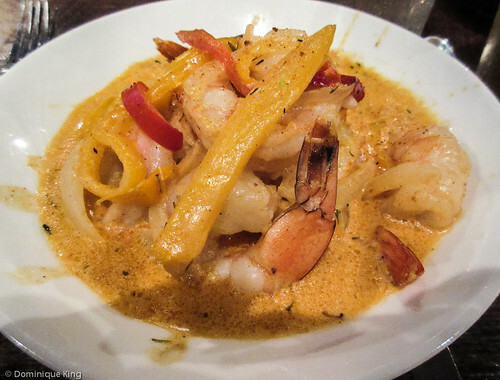 I loved my entree of creamy Creole Shrimp and Grits accompanied by a side of fried okra. The restaurant serves brunch, lunch and, in true Southern style, supper. Guests can also enjoy live jazz some evenings and smooth R&B during Sunday brunch. You can connect with Georgia Reese's at the restaurant's Web site or on Twitter. The name of Osteria Pronto at the JW Marriott hotel in downtown Indianapolis translates into "tavern", or a neighborhood gathering spot, and "ready", although simply fast food this is not. Chef Rino Baglio, born in Momasco, Italy, brings a love of classic Italian cuisine to the Osteria and a resume that includes winning many culinary awards as a basis for creating classic dishes with a modern flair and using fresh and locally sourced ingredients. Osteria Pronto sits off of the lobby of a major hotel, but this is no chain restaurant and could easily exist as a stand-alone restaurant suitable for special occasion dinners or a casual get- together with friends. A large open kitchen off of the main dining area adds to the casual ambience, while the smaller private dining area for groups like ours allowed for a more quiet and elegant experience. 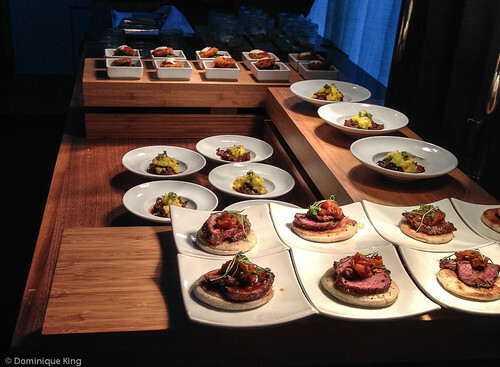 The meal started off with a buffet of beautifully plated appetizers and a small (?!) 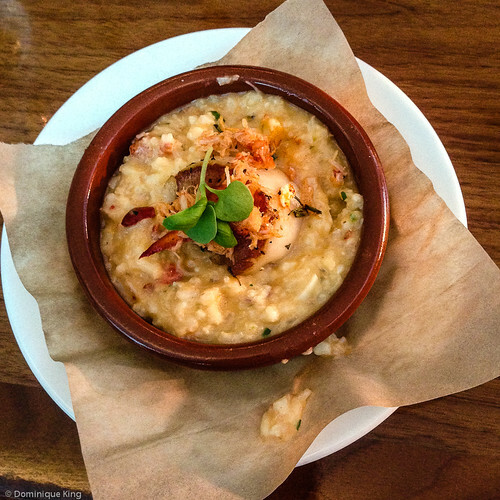 plate of Shrimp Risotto adorned by a large scallop. In a flip of the usual script, Tim had the sea bass while I opted for an entree consisting of a half-pound meatball atop pasta. I'm normally the one who eats seafood or a chicken entree, but the meatball was just too tempting and definitely delicious. Our wait staff was friendly and efficient, enthusiastically telling us about the menu and making sure our meals paired nicely with our wine. Diners do need to note that this restaurant is in a downtown hotel, and, while we didn't have to worry about it during our visit, other online reviewers noted the importance of paying attention to policies regarding self-parking or valet parking and having your parking tickets properly validated. I fondly remember the old Hudson's department store in downtown Detroit when Christmas wasn't Christmas until you went to visit Toyland on the store's twelfth floor and any day that involved lunch with mom in the Hudson's dining room was a major event. Folks growing up in Indianapolis report having similar fond memories of that city's L.S. 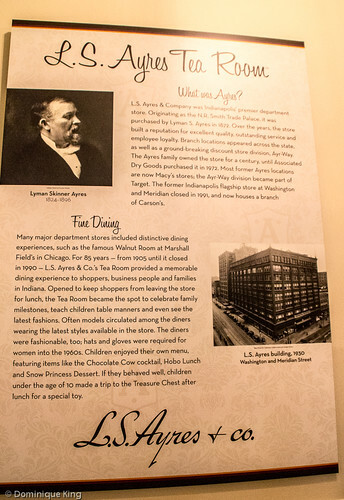 Ayres department store, even long after its 1992 closure, and the Indiana State Museum allows people to relive those precious memories by dining at a recreation of the legendary lunchroom. We got just a tiny taste of the experience with lunch at the Tea Room, which the museum furnished with reproductions of the wall coverings, carpets and brass chandeliers, as well as some original furniture. Models who later gained fame as actresses, like Jennifer O'Neill and Lauren Hutton, modeled at the store and the store hosted a showing of the first collection of Fort Wayne native Bill Blass. The Tea Room opens for private events like bridal showers, high teas and corporate meetings. 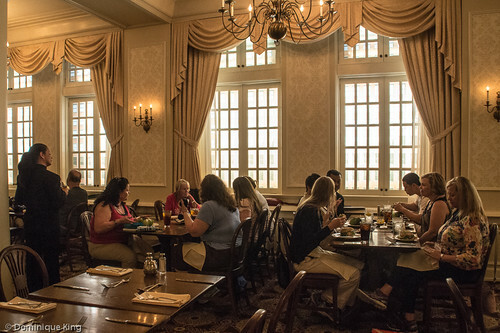 The public can occasionally dine there during holidays like Mothers Day, Easter and the Christmas holidays to enjoy Tea Room favorites like Chicken Velvet Soup, Pumpkin Fingers and Hawaiian Chicken Salad sandwiches. The day we dined in the Tea Room, we ordered from the menu of Museum's Farmer's Market Cafe, which stresses the use of locally sourced ingredients. Tim had a Smoked Brisket sandwich, and I opted for the Cherry Apple Chicken Salad sandwich. Both were very good, but that left me wanting to try some of the Ayres classics that folks from Indianapolis loved so much. But never fear, as Google is my friend and I managed to locate a couple of Ayres recipes online. It's even possible to locate an Ayres cookbook online if you're lucky. Chicken Velvet Soup or Pumpkin Fingers anyone?